Facts of Monarch Butterfly, "Scientific name for Monarch Butterfly Danaus plexippus". "Scientific name for butterfly Lepidoptera". The Monarch Butterfly is a milkweed type of butterfly that belongs to the Danaus genus of the Danainae subfamily in the Nymphalidae family. The Monarch butterflies are the most common butterfly in North America. The Monarch Butterfly of the eastern parts of North America is distinguished for its multi-generational southern late summer or autumn migration from the United States and the southern parts of Canada to Mexico. The Monarch Butterfly are famous for their long migration. Each year the monarch butterflies will make the great distance travel that can be as far as 2,500 miles (4000 km). The Monarch Butterfly from the western parts of North America more frequently migrate to the locations in California, but can be seen in overwintering Mexico locations. The Monarch Butterfly is a colorful butterfly, with a wingspan that ranges from 3 5/16 inches to 4 inches (8.8 to 10.1cm ). The wings of the Monarch Butterflies feature an effortlessly identifiable black and orange color pattern. Overwintering inhabitants of the Monarch Butterfly are seen in California, Mexico, all along the Gulf coast, throughout the year in Florida. In Arizona, their home offers the exact conditions essential for their continued existence. The overwintering home of the Monarch Butterflies usually offers them the required access to streams or wet soil, essential levels of humidity, cool temperatures, periods of sunshine for their body temperatures that enable their flight, appropriate plants on which to roost, fairly free of predators. Roosting Monarch butterflies can be seen on locusts, sumacs, basswood elm, Osage orange, oak, mulberry, willow, pecan, mesquite and cottonwood. Monarch Butterfly are insects. A Monarch Butterfly is a herbivore; Meaning that as a caterpillar its first food is its own eggshell and than it will eat the leaves of the plant on which it is hatched. When it becomes a full grown Monarch Butterfly, it will feed mostly on nectar from flowers, rotting fruit and variety milkweed plants and water with a "proboscis" - a long narrow tube in their mouth that looks like a straw. , whereas their caterpillars feed on the leaves of their host milkweed plant. The male Monarch Butterfly that is fit is more probable to mate. Both male and female Monarch Butterflies usually mate more than once. Female Monarch Butterflies that mate numerous times will lay more eggs. Mating for the overwintering butterflies takes place during the spring, before dispersing. Mating is less needy on pheromones than other varieties in the genus of the Monarch Butterfly. Courtship in Monarch Butterfly takes place in two stages. During the first stage, which is the aerial stage, the male Monarch Butterfly pursues and habitually forces the female butterfly to the ground. During the ground stage, which is the second stage, the butterflies copulate and stays attached for 30 to 60 minutes. Usually, only 30% of mating attempts will end in copulation, signifying that female Monarch Butterflies may be capable of avoiding mating although some have more triumph than others. During copulation, the male Monarch Butterfly transports the spermatophore to the female butterfly. Together with sperm, the spermatophore offers the female the necessary nutrition to assist her in egg-laying. A boost in the size of the spermatophore will increase the fecundity of the female Monarch Butterflies. Male Monarch Butterflies that create larger spermatophores as well fertilize more eggs of the female butterfly. The female Monarch Butterfly lays her eggs in the spring and summer seasons onto the leaves of milkweed plants. Life cycle of a Monarch Butterfly comes in four stages, egg, larva "caterpillars", pupa "chrysalis" and adult Butterfly. A Butterfly will attach its eggs to leaves with a special glue. The eggs will take about 4 days to hatch into caterpillars or larvae. The caterpillar first feeds on its egg casing and then it starts feeding on the milkweed and the sequester cardenolides, a kind of cardiac glycoside. When caterpillars become fully grown they will attach to an appropriate leaf or small branch, than they will shed the outside layer of their skin and a hard skin underneath known as a "chrysalis" will be their new look The adult Monarch Butterfly comes out after two weeks. An adult butterfly will come out from the "chrysalis" than it waits a few hours for its wings to dry and fill with blood, before it takes its first flight. The average lifespan of the Monarch Butterfly ranges from 2 weeks to 8 weeks. A Monarch Butterfly has three pairs of legs and their feet have little claws that help them stand on flowers. 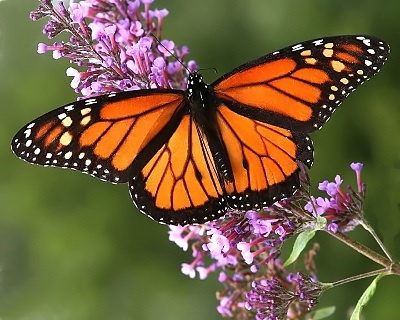 The Monarch Butterfly's wings are made up of hard tubes that are covered with a thin tissue. The Monarch Butterfly's wings are covered with fine dusty like scales. A Monarch Butterfly has four brightly colored wings having distinctive patterns made up of tiny scales. The bright patterns scales sometimes have hidden ultraviolet patterns for attracting mates. The bright colors are also used as camouflage to hide them or scare off predictors. The Monarch Butterfly can see yellow, green, and red. The top flight speed of a Monarch Butterfly is 12 miles per hour and some moths can fly up to 25 miles per hour. A Monarch Butterfly is cold-blooded, which means the body temperature is not regulated on its own. A Monarch Butterfly can't fly or eat if their body temperature is below 82 degrees fah (28 cel). Monarch Butterfly's are often basking in the sun with their wings open to gain heat and than the veins in the wings carry the heat to the body. The estimate is between 15000 and 20000 different species of butterfly. A Monarch Butterfly has a small body, made up of three parts – the head, abdomen and thorax. A Monarch Butterfly has two large eyes, which are made up of many small parts which are called "compound eyes". A Monarch Butterfly has two antenna's on the top of their heads, which they use to smell, hear and feel. A Monarch Butterfly’s mouth is a long tube a "proboscis" - a long narrow tube in their mouth that looks like a straw when its done eating, it rolls the tube back up.